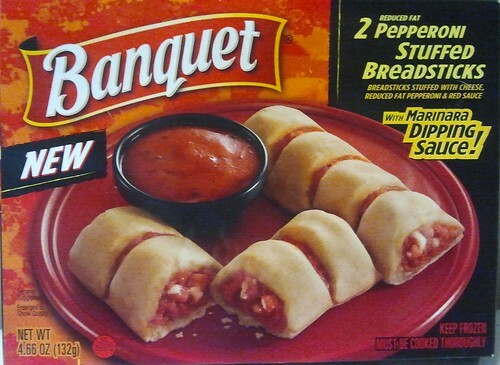 Here we go again, with another cheap, microwave-ready frozen snack from ConAgra's Banquet brand. This time, it's Pepperoni Stuffed Breadsticks with Marinara Dipping Sauce. Right out of the package, the frozen breadsticks look almost like real pepperoni wrapped in dough. Pay close attention to the product, though, and you'll see that the "reduced fat pepperoni stick" is actually an extrusion of red paste. The ingredients panel on the box horrifyingly reveals that the "reduced fat pepperoni" is in fact made of dough, "meat blend" made of beef and pork, textured vegetable protein, "restricted melt cheese," "substitute mozzarella cheese," and a Monsanto inventory's worth of various chemicals. It's quite a stretch for Banquet to call it a "stick" at all, since after cooking the pepperoni-dough core of the breadsticks melts and spreads and bonds with the plain bread dough exterior. 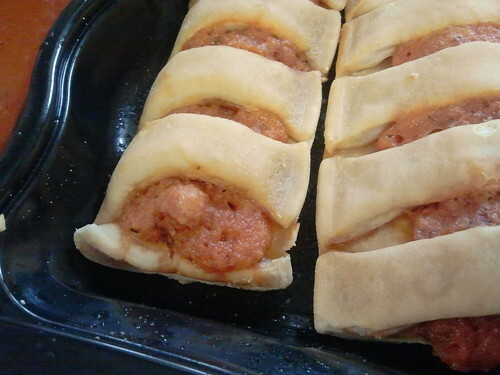 The overall effect is soft, chewy and doughy, like a nicely-baked soft breadstick but without any real type of crust. The marinara dipping sauce that comes with the breadsticks is fairly standard stuff, strongly flavored with oregano and seasoned with crushed garlic, onion, and other Italian-style herbs. While certainly not ground-breaking or very exciting, it is completely authentic-tasting. 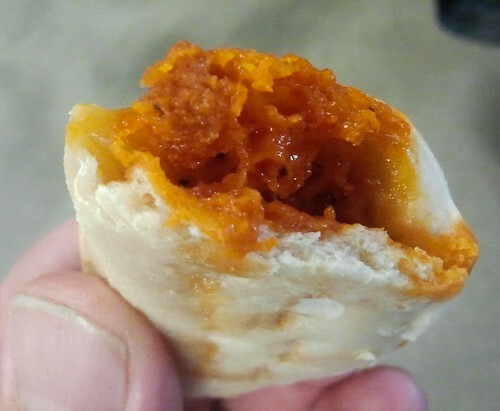 Just like with the previously-reviewed Beef & Cheese Quesadillas from Banquet, the Pepperoni Stuffed Breadsticks are - despite their Frankensteinian origins - totally delicious. I would absolutely buy them again. Seriously?!? 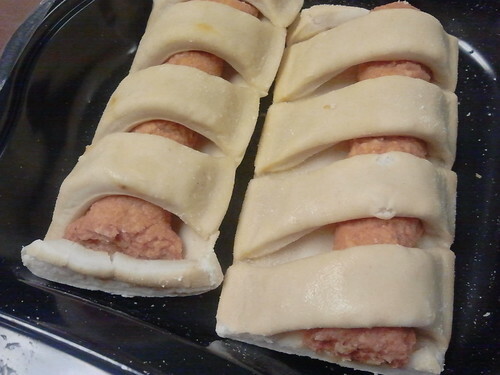 They look absolutely revolting, uncooked and cooked. 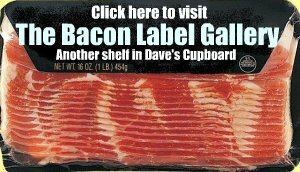 I would thing the paste like texture would be a huge turnoff. These were stomach-turningly bad. In addition to be being enough food for a light snack (thats being generous), they tasted like cardboard wrapped in bland dough. The sauce tasted decent, but it was a very liquidy soupy consistency that unsettling to look at. I strongly disagree with the reviewer, I'm never touching these things again.